I never knew a day existed to celebrate Down syndrome until I had a child of my own with the extra 21st chromosome. When I learned it was on March 21st, the first day of spring (well, this used to be the first day of spring! ), I thought that was perfect. Spring represents a new beginning. A waking up from our long hibernation. So to celebrate a condition that used to be left in the dark and cast in the shadows with the light of a new beginning sounds like a fantastic parallel. Also, the earth is in perfect balance between darkness and light. Between the shortest and longest days of the year. I took that idea a step further, and remembered what Martha Beck wrote in her memoir Expecting Adam (a fantastic read, by the way). To start the book, Martha was speaking with a psychic. Martha's son, Adam (a three-year-old with the extra chromosome), was coming through the psychic to tell his mother to relax a bit. That it was all going to be okay. Now, I don't know what you believe about spirituality or religion, and I'm not going to tell you what I think you should believe. But what this woman was saying was that Adam, a small child with Down syndrome, was both on this earth in physical form and lingering in the spiritual realm beyond what we can see. I instantly thought about Braeden when I read that. His wholeness, wisdom and ability to connect with everyone had me believe that my own son was on both sides of the veil as well. And still is. And probably, so are all people with this extra chromosome. They know, see and feel more than most people. They are in perfect balance. Just like the earth at this time. I cried when I learned all those things. One way to raise awareness for Down syndrome is to wear crazy socks today. Show them off. Take a picture of your wildly clad feet and post it on the internet. Get together in the office or school or grocery store with all the other people wearing crazy socks and hang it on a billboard. 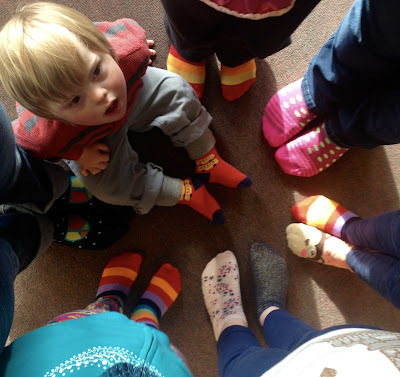 The school kids in their crazy socks! Because Down syndrome is cool, man. It's really cool. I am down with Down syndrome. Below is a video that totally jerked my heart strings. 50 mums and 50 4-year-olds with Down syndrome doing karaoke in their car. They are lip syncing and signing the words instead of singing. Seriously. Take 4 1/2 minutes of your day and check it out. It's World Down Syndrome Day! What really got me was seeing the moms' reactions to their children. The beaming pride. The deep, genuine love. The spontaneous laughter from spontaneous goofiness. I experience those things with Braeden everyday. And maybe all moms of all types of children do! I can't really compare because I am only Braeden's mom. That is what I know. It is also something I love. And I would not trade it for anything else. 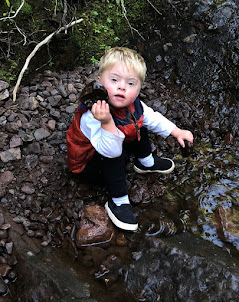 You couldn't offer me anything in this whole world that would make me want to take away my son's extra chromosome. It is truly a gift. A gift that gives love everyday. A gift in perfect balance. A gift of a new beginning.